The MPK-Ti is a heavy-duty, light-weight, non-magnetic knife designed to the demanding requirements of the Navy SEALs and Explosive Ordnance Departments. The MPK-Ti is immune to rust, corrosion, salt water and other chemical attacks. It has been proven to be the "World's Toughest Knife" by 20 years of vigorous SOCOM military usage without a single report of a broken MPK in the field and the 12" version has earned its own NSN number (NSN 1386-01-417-1263). All MPKs include the famous dual lock system of snap and rubber D-ring on a custom Hytrel sheath to be worn on the leg or thigh. This version of the MPK is made with our special blend of titanium, which has very superior wear resistance and is thru-hardened to Rockwell C 47, while still maintaining its flexibility. Field sharpening of the MPK is easy and the cutting edge retention is superior, while the V-ground blade is not susceptible to cracking or chipping. The MPK-Ti is available in 10" and 12" lengths standard 0.25" thickness, serrated or non-serrated, and handle colors in standard black or high visibility orange for Coast Guard or other underwater use. 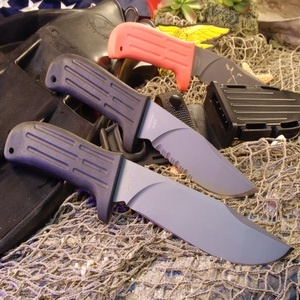 The handle material is Hytrel/Kevlar mixture, injection molded onto a full tang which prevents handle separation even when subjected to extreme stress. Use it, abuse it, and put it away wet or dirty, this knife will last for generations.